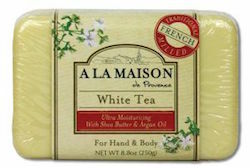 A La Maison's Traditional Recipe dates back to 1828 in France when Marseille soap masters developed the famous French Milled process. A slow cooking and purifying process which transforms Vegetable Oils into glycerin rich, smooth and lathering soaps; softer to the skin than other bar soaps. Ingredients: Saponified Palm Oil, Vegetable Glycerin, Sodium Gluconate, Shea Butter, Argan Oil, Mineral Pigments and/or Clay, Fragrance Blend with Plant Extracts and/or Essential Oils.